OK Shelia, now I really want to know if your subconscious mind led you astray and you really meant to type asparagus pea or if you did actually mean asparagus pee? I can answer both. 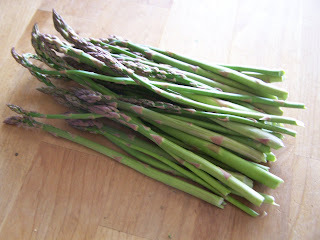 Yes, I do have asparagus pee after eating asparagus, I thought everyone did. And, yes...I do have a few asparagus pea seeds. Mary-Sue gave them to me and you've just reminded me that I need to plant them today. 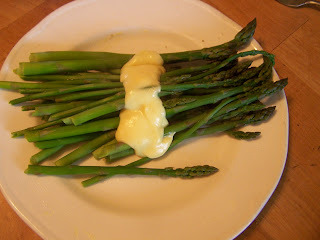 Now I have to try asparagus with hollandaise sauce. mmmmmm. I have 26 plants poking up (out of 54 I planted) so there's BIG hope for next year! It's not so clear to me, tho, DID you save him any asparagus? Did he only get one spear?